Adenoviruses (AdVs) are double-stranded nonenveloped DNA viruses, causing self-limited respiratory, gastrointestinal, and conjunctival disease or hemorrhagic cystitis in some. Solid-organ transplant (SOT) recipients have been associated with both reactivation of latent infection and de novo infections and particularly seen in pediatric recipients. Adv infection is defined by isolation of the virus on culture, detection of viral antigen by immunoassay techniques, or detection of viral DNA by polymerase chain reaction (PCR) in the samples obtained from the body fluid or tissue, irrespective of symptoms. Patients on antilymphocyte antibodies and patients with donor-positive/recipient-negative pretransplant serostatus are considered as high risk group. Majority of Adv infections have been reported among stem cell transplant recipients, the incidence of disease ranging from 3% to 47%., In view of paucity of literature regarding the prevalence of Adv infection in SOT recipients, this study was done to assess the incidence of Adv infection in liver transplant (LTx) and renal transplant (RT) recipients from our center. In this retrospective study, archived blood samples from all consecutive LTx and RT recipients from April 2017 to September 2017 within day 1 to day 100 posttransplant course were collected (follow-up samples of some patients included). The clinical details were obtained from the virology database and hospital information system. Patients receiving antiviral chemotherapy at the time of specimen collection, patients who had received combined liver and kidney transplant, and blood samples received after 100 days posttransplant were excluded from the study. One hundred and fifty leftover plasma samples were retrieved for Adv testing by real-time PCR. Extraction of DNA was done by QIAsymphony DSP Virus/Pathogen Mini Kit and real-time PCR was performed on Rotor-Gene Q Instrument using Qiagen Microbial DNA AdV q PCR kit. Of 150 samples, deceased donor LTx and living donor LTx comprised 129 while 21 samples were from RT patients. Of 150, there were 8 samples from pediatric patients who had undergone LTx. 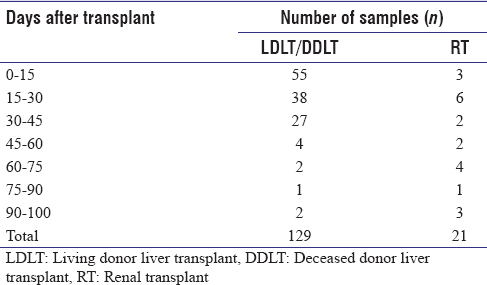 The distribution of samples according to the time after transplant is shown in [Table 1]. Majority of samples for both LTx (39.53%) and RT (33.3%) patients were from routine follow-up cases while fever comprised second most common cause (LTx, 29.4%, and RT, 28.57%). Adv was not detected in any of the samples. This study is among the first to retrospectively evaluate Adv infection in adult and pediatric SOT recipients from India, demonstrating the absence of Adv viremia in the same. Majority of patients were symptomatic, although asymptomatic screening was done in 38.67% (58/150). Cumulatively, by most previous studies, the prevalence of Adv viremia in SOT has been reported in 4%–10% and 4.1% of LTx and RT recipients, respectively. This is in contrast to what we observed. It probably reflects the retrospective review which is less likely to detect asymptomatic and mildly symptomatic cases. Furthermore, majority of the studies have reported higher infection rates in pediatric population with LTx which accounted for only 5.3% (8/150) in this study. Finally, more prospective studies which include specimen collection at the time of presentation of symptoms by the patients are required to fill our void in understanding the current scenario of Adv infections in SOT recipients in India. Venard V, Carret A, Corsaro D, Bordigoni P, Le Faou A. Genotyping of adenoviruses isolated in an outbreak in a bone marrow transplant unit shows that diverse strains are involved. J Hosp Infect 2000;44:71-4. Runde V, Ross S, Trenschel R, Lagemann E, Basu O, Renzing-Köhler K, et al. Adenoviral infection after allogeneic stem cell transplantation (SCT): Report on 130 patients from a single SCT unit involved in a prospective multi center surveillance study. Bone Marrow Transplant 2001;28:51-7. Green M, Ljungman P, Michaels MG. Adenovirus, parvovirus B19, papilloma virus, and polyomaviruses after hemopoietic stem cell or solid-organ transplantation. In: Bowden RA, Ljungman P, Paya CV, editors. Transplant Infections. Philadelphia: Lippincott Williams and Wilkins; 2003. p. 412-38. Baldwin A, Kingman H, Darville M, Foot AB, Grier D, Cornish JM, et al. Outcome and clinical course of 100 patients with adenovirus infection following bone marrow transplantation. Bone Marrow Transplant 2000;26:1333-8. Bruno B, Gooley T, Hackman RC, Davis C, Corey L, Boeckh M, et al. Adenovirus infection in hematopoietic stem cell transplantation: Effect of ganciclovir and impact on survival. Biol Blood Marrow Transplant 2003;9:341-52. Echavarría M. Adenoviruses in immunocompromised hosts. Clin Microbiol Rev 2008;21:704-15. Watcharananan SP, Avery R, Ingsathit A, Malathum K, Chantratita W, Mavichak V, et al. Adenovirus disease after kidney transplantation: Course of infection and outcome in relation to blood viral load and immune recovery. Am J Transplant 2011;11:1308-14.